The need for solution providers to guide companies through IoT projects—from the procurement of hardware and sensors to the monitoring and management of new systems—is greater than ever before. Here are CRN's picks for the 50 coolest IoT companies of the year that solution providers can look to for a leg up. Solution providers say their very survival rests on how successful they are at automating arduous IT tasks for today's digital transformation customers. Our 2019 Channel Chief honorees are selected by CRN's editorial staff on the basis of their professional achievements, standing in the industry, dedication to the channel partner community and strategies for driving future growth and innovation. 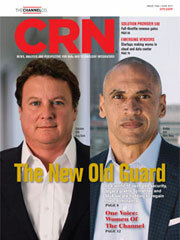 In its fourth year, CRN's annual Security 100 gives solution providers a clear path to navigate the fast-growing security vendor market. CRN's Data Center 50 list highlights the key companies evolving and powering today's data centers through innovative offerings. Here are 10 software-defined storage offerings that can help customers see lower costs and increased ﬂexibility. The Channel Company's Executive Chairman Robert Faletra says the battle for supremacy in the cloud market continues to heat up. CRN's Steve Burke highlights the off-the-charts recurring revenue growth being driven by strategic service providers. The ability to translate a future-facing view of technology into reality today is the crowning achievement of this year's Tech Innovator winners. Faletra: Why Doesn't Anyone Talk About IBM Anymore? The Channel Company's Executive Chairman Robert Faletra covered IBM during the 1980s, and now he wonders why the technology giant no longer wants to step to the forefront and be part of the conversation. CRN recognizes the 46 organizations that earned a spot on all three of our solution provider lists this year with the annual Triple Crown honors. CRN highlights 10 new software offerings for managing and analyzing data that's moving faster and exploding in volume. Now is the time for strategic solution providers to double down on sales and execution. CRN's 2018 Network Connectivity Services Partner Program Guide is meant to highlight some of the industry's leading portfolios of telecom, cloud and connectivity offerings. Hyper-converged infrastructure (HCI) combines storage, computing, networking and software into a single system aimed at reducing complexity and boosting scalability. For the vendor and partner community alike, it's important to gauge where the market is headed to react and capitalize on the future structure. Solution providers and other industry observers say the applicability of blockchain, the distributed ledger technology that powers cryptocurrencies, has the potential to impact banking and financial markets, insurance, retail and consumer goods, health care, government and transportation and more. 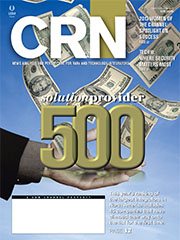 CRN's Solution Provider 500 ranks the top integrators, service providers and IT consultants in North America by services revenue. Solution providers have the advantage of understanding IT threats and should use it when appropriate as a selling technique. When a technology can completely change the way a business operates, you'd better get on board. Solution providers are calling SD-WAN the biggest sales driver in almost two decades. CRN rounds up 10 of the latest devices -- from business-friendly smartphones to portable and always-connected laptops and tablets to accessories -- for getting the job done. The 2018 Partner Program Guide is based on detailed applications submitted by over 270 vendors, outlining all aspects of their partner programs. In its third year, CRN's annual Security 100 gives solution providers a clear path to navigate the fast-growing security vendor market. Encore Technology Group President and CTO Michael Knight said partners looking to break into the MSSP space should examine where their talent is today, what they can do that's repeatable, and what they have to change. CRN presents the 2018 Internet Of Things 50, a list of the coolest vendors in security, hardware, industrial IoT, and software and services. The Tech Elite 250 is comprised of solution providers who have the highest level and most certifications from the industry's leading vendors. Hyper-converged infrastructure and software-defined networking are changing the cloud dynamics. On-premises may actually prove to be more cost-effective than pure public cloud deployments. LogicMonitor's David Powell shares his practical guide for channel success. Bug bounty programs are nearly as old as the internet itself. But today they’re big business for solution providers that can offer complementary consulting, triage and remediation services. CRN again assembles the Managed Service Provider 500, an annual list that recognizes North American solution providers with cutting-edge approaches to delivering managed services. The data center evolution shows no signs of slowing down, but how do solution providers quickly adapt their business models and keep an eye out for innovation at the same time? That's where the Data Center 100 list can help. In the Tim Cook era, Apple has pivoted from a product-driven company with excellent marketing to a marketing-driven company with mediocre products. Google, Cisco, Intel and Red Hat came out on top in a CRN survey of vendor response to the Spectre and Meltdown vulnerabilities. While vendors are innovating at the edge with new products and services, customers remain confused about how they can take advantage of and drive value from edge computing. 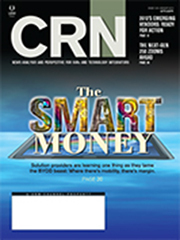 CRN highlights five companies that are creating innovative and unique edge computing offerings for partners and customers. 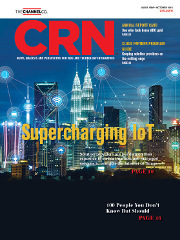 For solution providers just getting into the IoT arena to those already building their business around the technology, here is CRN’s list of the 50 coolest companies in security, hardware, industrial IoT, and software and services. For HP And HPE partners, there's no question who is responsible one of the all-time great turnarounds in corporate history - Meg Whitman. VMware CEO Pat Gelsinger has powered the virtualization market leader into the multi-cloud era with breakthrough new partnerships and products, including VMware Cloud on AWS and AppDefense. Hot startups in even hotter technologies: networking/VoIP and the Internet of Things. 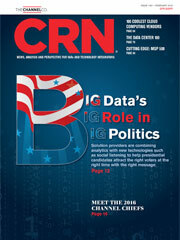 CRN highlights 10 offerings and industry developments that provide new ways to manage and analyze big data. With the pace of change in the market and the need to cut costs and drive revenue, MDF scrutiny is going to increase. All of the recent paradigm shifts in IT pale in comparison to the Internet of Things, a transformation that requires solution providers to make significant investments in order to reap the rewards. Intel's new "Skylake" Xeon Scalable Platform is at the heart of a new crop of servers destined to impact the data center. Vitagliano, a channel legend and current CEO of Computex, will accept the honor at The Channel Company's XChange 2017 conference being held next month in Orlando, Fla.
Dell Technologies CEO Michael Dell's agility, adaptability and willingness to buck the status quo put him at the top of the class in this year's Top 100 Executives. Linksys has long been known has a company capable of delivering enterprise-class products at SMB prices, but since being acquired by Belkin, it has significantly upped its investments in technology innovation and partner program improvement. Faletra: Is Marketing A Make Or Buy Decision? Legacy security giants Symantec and McAfee are undergoing drastic business changes to better compete in a complex security market littered with hot startups. This year, CRN honors more than 500 women whose channel expertise and vision are deserving of recognition. For women in the IT world, being the voice of change starts with being a voice for each other. While big vendors generate their share of ground-breaking products, startups are a major driver of innovation and are changing the rules of the game. 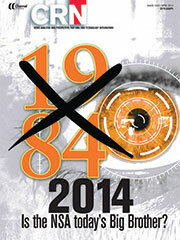 Faletra: What Is High-Tech's Obligation In The War On Terror? The 2017 Partner Program Guide is based on detailed applications submitted by over 250 vendors, outlining all aspects of their partner programs. The 2017 installment of CRN's Security 100 highlights the best of the best in network security, SIEM and threat detection, web, email and application security, and identity management and data protection. The Tech Elite 250 is comprised of solution providers in the U.S. and Canada who have the highest partner levels from Amazon, Cisco, Google, HPE, IBM, Intel, Microsoft, Trend Micro and VMware. Here is a sampling of that list. The strategic service provider shift is forcing cloud services companies, including Google, to step up to the plate with new channel models. KKR executive Herald Chen spoke with CRN about why the opportunity is greater than ever for an investment in a solution provider company like Optiv Security and what value private equity in turn can bring to the channel. The 2017 installment of CRN's 100 Coolest Cloud Computing Vendors highlights the best of the best in cloud infrastructure, platforms and development, security, storage and software. Broken into five categories, the DC 100 highlights the providers that represent their respective fields with a combination of innovation, market share, and technology and channel capabilities. CRN's fourth annual Managed Service Provider 500 recognizes recognizes North American solution providers with cutting-edge approaches to delivering managed services. CRN looks at 10 products that combine the ease of use expected in consumer storage devices with the robust reliability and functionality demanded of business-class storage devices. Tech vendors can learn a lot from the massive bets private equity firms are placing on the channel - an all-time high at more than $25 billion in 2016. Containers are changing the way enterprises consume IT, and solution providers proficient in the technology possess one of the hottest skill sets on the planet. It’s not too late to grab hold of the opportunity. For this year's Products of the Year, CRN editors selected five finalists among 17 technology categories and then asked solution providers to rate the products to determine a winner. Here are the hot products that stood out from the rest in 2016. The Channel Company has been running events for more than 25 years, yet it's still impressive to see a vendor executive with the capacity to network with the crowd and actually use an event to foster relationships with solution providers. Placing a sharp focus on a no-holds-barred unique consulting methodology is key to the success of any and all solution providers in 2017. Solution providers have the customer relationships, vertical market expertise and managed services savviness to power up today's innovative Internet of Things solutions. Innovative cloud partner programs are key to solution provider success. These vendors are addressing today's pain points. CRN assembles a number of lists and rankings throughout the year, including the Solution Provider 500, the Fast Growth 150 and the Tech Elite 250. CRN recognizes the 48 solution providers that earned a spot on all three lists this year with the third-annual Triple Crown honors. The recent news that Tech Data would acquire Avnet's Technology Solutions business comes on the heels of Ingram Micro's announced sale of its entire business to a China-based logistics conglomerate. When a major insurance provider had millions of dollars in policies put at risk because its IT department did not have a rigorous SOC 2 compliance report, it turned to one of the top MSPs in the Midwest. Concerns over privacy and security in the cloud have hit fever pitch, spurred by a battle over an encrypted iPhone and ongoing worries over government access to personal information. It's up to solution providers to be the first line of defense. CRN looks at 10 technologies that are advancing the still-elusive, but someday-to-be-ubiquitous, software-defined data center. 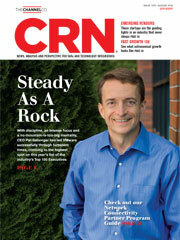 Each year, CRN looks at the hot IT startups making an impact on the channel. Here we present the CRN Top 100 Executives of 2016 list, the fastest-moving executives in a market moving at warp speed. The industry's leading portfolios of telecom, cloud and connectivity offerings. The Fast Growth 150 is CRN's annual ranking of the fastest growing solution providers, resellers, technology integrators and IT consultants in North America. CRN's 2016 CRN Partner Marketing Guide lists marketing programs that vendors offer to VARs, providing support, services and capabilities to the indirect IT channel. Cloud services offer the promise of lucrative, monthly recurring revenue, but solution providers always need to be able to offer a full IT solution to their customers. To that end, connectivity services are critical: Customers can't reach the cloud without it. NWN recently launched a new entity, NCapital, aimed at providing the financial muscle and technology know-how for customers to move to the cloud without making capital expenditures. Five years into his reign at the helm of Apple, CEO Tim Cook and the Apple board need to start "thinking different" about the channel and the company's entire approach to the market. Entering his second year on the job, Cisco CEO Chuck Robbins is putting his stamp on the company with a new recurring revenue software model to keep its core networking business and channel healthy. The channel is undergoing a significant evolution as VARs and solution providers morph into strategic service providers: independent trusted technology consultants that drive business outcomes with an emphasis on cloud and managed services delivered through a recurring revenue model. This year, CRN honors nearly 500 women whose channel expertise and vision are deserving of recognition. CRN's Steve Burke ranks the industry's top CEOs when it comes to communicating their sales strategy to channel partners. Solution providers have to navigate through a fast-moving telecom landscape as carrier churn escalates and a new class of tier-two cloud service providers swoops in. The telecom industry is in a state of flux as customers demand cloud and strategic IT services, in addition to connectivity. The 2016 Partner Programs Guide offers the information solution providers need to evaluate the IT vendors they work with or are considering working with. CRN's annual Partner Programs Guide offers solution providers the information they need to evaluate the IT vendors they already work with or are considering partnering with. CRN's Security 100 highlights the best of the best in endpoint protection, SIEM and threat detection, network security, identity management, and application security. From server virtualization to hyper-converged infrastructure, the Virtualization 50 celebrates the vendors tackling the different facets of virtualization technologies. 86 percent of solution providers are planning to add a new vendor or a technology practice in 2016, but most vendors are in the dark when it comes to the partner's decision making process. Solution providers are combining analytics with new technologies such as social listening to help presidential candidates attract the right voters at the right time with the right message. By taking a nonpartisan stance, solution providers are reaping lucrative rewards this election season. Xamarin's technology lets developers build native iOS and Android apps using Microsoft's C# programming language, which means they can write one set of code and use it for apps targeting multiple platforms. The 2016 installment of CRN's 100 Coolest Cloud Computing Vendors highlights the best of the best in cloud infrastructure, platforms and development, security, storage and software. CRN has assembled the 2016 Managed Service Provider 500, an annual list that recognizes North American solution providers with cutting-edge approaches to delivering managed services. It's officially a new era in the channel, with business consulting and recurring revenue services taking precedence over project-based, on-premise technology procurement. To find CRN Test Center gold we tinkered, tested and sometimes got tough with the best 2015 had to offer when it came to tech. From big iron to thin and light, we reviewed close to 100 products over the past year and present the gear that had the just-right mix of wow and practical business applications. The winners of the 2015 Enterprise App Awards were carefully chosen by CRN editors and represent both the heavy hitters of the IT industry and the lesser known startups that are driving innovation. CRN assembles a number of lists and rankings throughout the year, including the Solution Provider 500, the Fast Growth 150 and the Tech Elite 250. CRN recognizes the 57 solution providers that earned a spot on all three lists this year with the second-annual Triple Crown honors. The Internet of Things market is exploding, with an estimated $19 trillion opportunity up for grabs. CRN has compiled its inaugural list of 50 companies who are building tailored-made IoT solutions that channel partners need to know. The Strategic Service Provider model represents solution providers who become strategic partners to customers by recommending and implementing everthing from communication providers to which application, platform and hardware providers to depend on. Here we present our annual honoring of the channel management executives who may have slipped under the radar despite building booming channel programs, designing innovative partner incentives, evangelizing hot technology and much more. 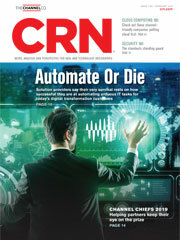 Solution providers across America put on their thinking caps and graded their IT vendors across 22 product categories as part of CRN's Annual Report Card, which is celebrating its 30th anniversary this year. When it comes to managing the rapid growth they've experienced, this year's Fast Growth solution providers can sum up their success strategies in one word: focus. Time Warner Cable (TWC) is on a channel tear, doubling its channel budget in the last 18 months as part of an all-out IT solution provider recruitment binge. Technology in big data management and analysis continues to evolve at a break-neck pace. Here's 10 recent product launches and key upgrades that you need to know about. Honesty Is The Best Policy: What's The Big Secret With Surface? When Microsoft launched its Surface tablet and decided it was going to be a direct-sale-only product, with no offering it to customers through the channel, it was a point of contention. Symantec CEO Mike Brown must feel like the weight of the world has been lifted off his shoulders now that his company is focused squarely on the red-hot security market. Amazon has built its entire business around the idea of moving quickly. Andy Jassy has taken this philosophy to a whole new level with Amazon Web Services. CRN's Top 100 Executives Of 2015 honors the tech CEOs that are best at navigating a market that is transforming at a blinding speed. 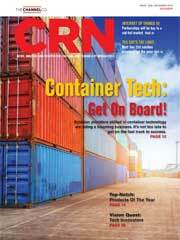 This year's edition of the CRN Emerging Vendors list has more than 180 companies, all with something going for them. Our Emerging Vendors are actively working with channel partners in North America. We present the 2015 CRN Next-Gen 250, the annual list of solution providers that are setting the pace for the rest of the channel in meeting customers' ever-evolving IT needs. Here we present 25 companies on CRN's 2015 Next-Gen 250 list, a spotlight shined on 250 solution providers born since 2005. Faletra: The Clouds Of The Future: Where Does The Channel Stand? The move to cloud-based computing is rapidly becoming a reality for businesses in all markets, opening the door for startups and leaving hardware-infrastructure-focused vendors without clear cloud strategies in the dust. Army ELA: Weapon Of Mass Confusion? 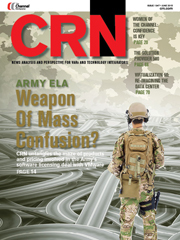 CRN untangles the maze of products and pricing involved in the Army's software licensing deal. VMware's 2013 enterprise licensing agreement with the U.S. Army led to larger-than-expected bills for some subordinate commands, but there have been some DoD ELAs that have worked out quite well. According to licensing experts CRN spoke with, the cloud model isn't the cost-control panacea some ELA-weary customers might think it is. The CRN Big Data 100 recognizes vendors that have demonstrated an ability to innovate in bringing to market products and services that help businesses work with big data. The reality is that the cloud model, while exciting and a better place to be over the long term, is not going to be the only way to deploy IT for a very long time. Meg Whitman, Dion Weisler and HP partners say the company's historic split will put both new businesses in prime position to knock down some old-school competitors. HP laid out the challenges it will face with its upcoming split in a filing with the SEC last month. Here are five "risk factors" associated with the split. The 2015 Partner Program Guide offers the information solution providers need to evaluate the IT vendors they work with or are considering working with. The technology landscape is transforming so quickly that it's hard for any business—vendor or solution provider—to keep up with the pace of change. But one thing remains constant: the power of partnerships. Here we present the distributors and their programs worthy of making the 2015 Partner Program Guide. Solution providers and vendors gathered in Dallas recently for XChange Solution Provider 2015. XChange also was the venue for CRN's 25th annual Channel Champions awards. Here are the victors in each technology category. IT skills can go stale very, very quickly and the solution providers on CRN's Tech Elite 250 know this better than anyone. The Tech Elite 250 is comprised of solution providers who differentiate themselves by investing in certifications in the area of infrastructure, including data center, storage and virtualization. Here is a sampling of that list. These 10 products add to traditional data loss prevention, antispam and website security capabilities, improving insight into weaknesses often targeted by attackers. Burke: Is Hardware Success The Solution Provider's Worst Enemy? No matter how fast you are moving to transform your business in the cloud services era, the depressing reality is you are not moving fast enough. The margins may be high, but solution providers need to weigh the risks associated with partnering with security startups. Is the IT security market too crowded? These startups certainly don't think so. Here are six security startups worthy of the channel's attention. The 2015 installment of the 100 Coolest Cloud Computing Vendors highlights the best of the best in infrastructure, platforms and development, security, storage and software. CRN's annual MSP 500 list recognizes those companies whose approach to managed services is one innovative step ahead. CRN looks through the crystal ball and offers 10 predictions for the storage industry for 2015. If you need proof that the solution provider landscape is changing, look no further than the merger of Accuvant and FishNet, creating a $1.5 billion security giant with 1,400 employees. Amazon CEO Jeff Bezos believes AWS could become the company's biggest moneymaker as it forges more ties with enterprise IT buyers. Will solution providers share in that success? The CRN Test Center presents 10 cloud solutions that are transforming the way organizations conduct business. CRN assembles a number of lists and rankings throughout the year, including the Solution Provider 500, the Fast Growth 150 and the Tech Elite 250. CRN recognizes the 26 solution providers that did earned a spot on all three lists with our first-ever Triple Crown honors. Apps are the gifts that keep on giving to every enterprise worker. 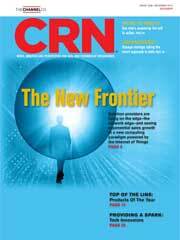 The CRN Test Center hands out Appy honors in 10 categories, as well as an Editors' Choice. The CRN Test Center's Tech Innovator Award program recognizes companies for outstanding innovation in products developed for the enterprise. Here we present to you the The 2014 Tech Innovators. If you are running a solution provider business today that is not driving 51 percent of profit from the service side of the house, you need to take a hard look at your business. Amazon is missing out on a big chunk of the enterprise-class data center market largely because it has failed to look beyond its born-in-the-cloud partners. 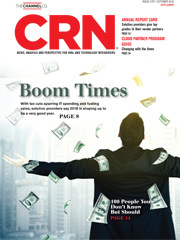 CRN's Fast Growth 150 solution providers know a thing or two about keeping up to speed and up to date with the latest technologies and business models. Here's how the top 25 stayed at the top of their game. Successful solution providers know that times of change create opportunities. The solution providers on this year's Fast Growth 150 list are doing just that. CRN looks at the under-the-radar players that make sure solution provider partnerships thrive and business gets done. CRN has been polling solution providers for 29 years for their take on the strengths and weaknesses of the IT vendors they work with. CRN's first-ever Cloud Partner Program Guide highlights those companies with the right programs in place to help solution providers kick things into high gear. Where Is The Cloud Taking Business? For solution providers specializing in the cloud computing market, business is growing at breakneck pace. CRN looks at some of the hottest virtualization products for streamlining data centers and making them more productive. As managed services become increasingly viewed as a commodity, the time is now to transform into a recurring revenue services business that capitalizes on next-generation cloud-based vendors. Every once in a while something comes along that is so preposterous it's silly and, dare I say it, stupid. Cisco CEO John Chambers has been through market transitions before, but his planned retirement is the real change on the minds of Cisco's partners. Combine a tech market that is rapidly discarding old business models with the damage done by a rogue former government contractor and you have what may well be the most treacherous terrain ever faced by technology CEOs. This year no one person has rattled the worldwide technology market, its vendors, vendors' partners, and business owners large and small more than Edward Snowden. Our list of more than 350 emerging tech startups in 2014. As IT networking and telecom vendors expand into new markets or offer new technologies, solution providers must constantly evaluate—and re-evaluate—which vendors they should be partnering with. In today's rough-and-tumble IT market, offering ground-breaking technologies or adopting the latest business practices is almost a requirement rather than providing a solution provider with a competitive edge. Solution providers that are setting the pace for the rest of the channel. While hardware fills all that data center space, it is the software behind it, including data center infrastructure management (DCIM) and other applications, that makes it all run efficiently. When vendors are under intense pressure, solution providers are always the first to fall subject to the whims of top management aiming for short-term transaction gains rather than long-term strategic strength. The top solution provider organizations in North America, ranked by revenue. This year's Solution Provider 500 companies have managed not only to survive-but thrive-by specializing in cloud computing, converged infrastructure, big data analytics and more. Among the companies named to this year's Solution Provider 500 are 62 companies that are new to the list. These 10 security vendors specialize in providing assistance throughout the entire life span of an attack from rapidly detecting a threat to containment and providing information to digital forensics investigators. Take a look at the 15 most popular certifications, how much money they make and why IT professionals say they are key to have as part of the solution provider portfolio. CRN presents its annual list of the virtualization vendors -- established players and the startups – that need to be on the channel's radar. 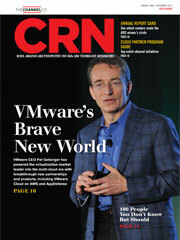 Virtualization, whether in terms of servers, storage, networking and applications, is now table stakes for the channel. Burke: The Cloud Vital Signs: Are You Digging Your Own Grave? The amount of new practices, products and recurring revenue services brought to market are the vital signs of a solution provider business. Here are the top priorities partners should focus on to determine a vendor's commitment, and suppliers can use to assess their own programs. Concern over the U.S. government's global surveillance program has prompted potential clients to demand increased transparency into internal processes when evaluating cloud services. Channel Champion award winning vendors were chosen based on the scores provided by 6,000 solution providers across a wide range of technologies. The 2014 Partner Program Guide offers the information solution providers need to evaluate IT vendors they work with or are considering working with. Speed, design and innovation continues to be defining factors driving the 2014 tablet market. Here are 10 tablets that are sure to make noise this year. The Tech Elite 250 is comprised of solution providers in the U.S. and Canada who have the highest level and most certifications from the top vendors. Here is a sampling of that list. No matter how you cut it, customer adoption of the cloud is happening at a faster pace than anyone anticipated, and it has all comers scrambling to play catch-up in what is sure to be an era of heightened channel conflict. For channel partners that represent a single vendor in the market in any technology segment, if that vendor falls into a particularly difficult situation, the partner is at risk as well. 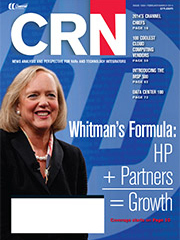 Leading up to Hewlett-Packard's annual Global Partner Conference, HP CEO Meg Whitman spoke with CRN about the importance of partner engagement in the "new style of IT." The Cloud 100 list aims to help solution providers navigate the growing cloud marketplace and identify the best solutions to support the IT channel. The Data Center 100 looks at the kind of partners that offer their own combinations of innovation, market share, market presence, buzz, technology capabilities and channel capabilities. These 271 executives are the who's who of channel management--heading up the partner programs that solution providers depend on to run their businesses. CRN's inaugural MSP 500 list honors the top technology providers and consultants, whose forward-thinking approach to providing managed services is changing the landscape of the IT channel. The Eaton victory is a case study in how to build a channel program. It required a major investment over the past five years with a fanatical commitment to constantly improving every aspect of the program and, just as importantly, the product line itself with big investments in data center software. For partners on the fence about the Meg Whitman era at HP, it's time to start feeling confident about the company's $112 billion commitment to solution providers. It's been a great year for products. Large companies built on their past successes, while emerging firms delivered innovative solutions that could transform service industries and the high-tech landscape. Here's a look at 10 new cloud products and services from some of the top cloud players in the industry, including Verizon Terremark Cloud Compute and Amazon Workspaces. Michael Dell's long fight to take his company private is over, but that doesn't mean he's on easy street. Michael Dell Makes His Bold Case To Partners: Why Dell? 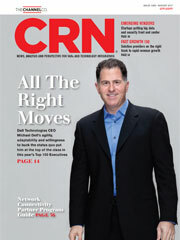 Michael Dell takes the CRN hot seat, fielding hard questions about the future of the channel and how the company hopes to move the needle on growth. Many longtime partners that have gone all in selling the SonicWall appliance line told CRN they now have to share the battlefield with the Dell direct sales force. Get a first look at CRN's third annual exclusive new research study, Best Companies To Partner With, which asked solution providers to rank their must-have technology vendors. Palo Alto Networks was built from the ground up as a 100 percent channel sales company and its channel sales team has made sure that its sales model is just as disruptive as its next-generation firewall. When it comes to what happens in the field, solution providers need engagement with partner account managers that are focused on helping partners go to market together. CRN Enterprise App Awards recognize the year's best apps for communication, administration, information access and management, contact management and productivity. Step by step, cloud-focused solution providers are looking to adopt the managed cloud-as-a-service model and get into the ERP cloud game. Solution providers are always looking for more than just a vendor--they're looking for a partner as well. Here are the companies they believe have gone above and beyond. Which vendors are treating their partners right? 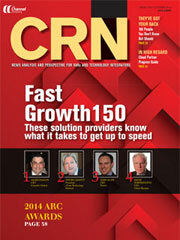 Solution providers tell all in CRN's Annual Report Card. CRN looks at the vendors whose channel programs either made big improvements or took a step backward according to the solution providers who rated them in this year's Annual Report Card. The results are in. Solution providers surveyed in 19 categories offer a look at which vendors are doing best by their partners. Here are the IT vendors to which solution providers awarded top honors in each category. In an industry that keeps reinventing itself, leaders have to have a steady hand and an open mind. 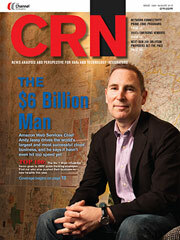 As part of our ranking of the Top 100 Executives Of 2013, CRN looks at the 25 executives who shook up the IT industry this year. In an industry that keeps reinventing itself, leaders have to have a steady hand--and an open mind. Here, we present the 25 Most Influential Executives Of 2013. 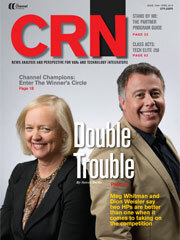 For big time players like Michael Dell and Meg Whitman, success with the channel is personal. Because the technology market is continually changing, there is no perfect channel for very long. But there is a way to get very close to one, and it requires CEO leadership, a team of loyal executives that believe in the goal, and a commitment to take feedback from the field and build a business that is easier to work with. The solution providers on this year's Fast Growth list have just short of $24 billion in combined annual revenue, up from $21.1 billion last year, $10.4 billion in 2011 and $5.3 billion in 2010. CRN's Tech 10 looks at the latest UltraHD products currently available for the channel to leverage from Sharp, Sony, LG, Asus and Dell, plus digital display technology from Apple, AMD, Intel, Samsung and Viewsonic. Now comes the hard part for Michael Dell. With the yearlong battle behind him to take Dell private, the company founder now faces the biggest business challenge of his lifetime. The desire for customers to invest more in line-of-business, customer-facing offerings is driving more customers to outsource IT-telecom overhead to solution providers. When it comes to mobility, the key for solution providers is to translate technology expertise into sellable solutions. Here we present 50 technologies, apps and devices to help solution providers get the most bang for their mobile buck. The latest "Tech 10" list from CRN looks at the high-performance servers, chillin cooling equipment and other technologies making waves in the data center. There's an old saying that goes: Where there's mystery, there's margin. Now there's a new saying: Where there's mobility, there's margin. CRN's Kathy Kim spoke with Chris Frey, vice president of North America channels and SMB at Lenovo, about the opportunities and challenges around mobility. Following are excerpts. Here we present part one of the top 50 on CRN's 2013 Next-Gen 250 list, a spotlight shined on 250 solution providers born since 1998. As the move to more toward managed services, off-premises private cloud and, ultimately, to public cloud continues, the criteria vendors will use to choose channel partners will change. Startups are providing solution providers and MSPs a solid option for cloud storage, but before you sign up, be sure they are who they claim to be. 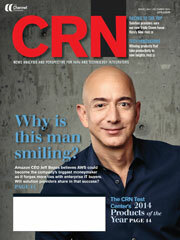 How Peeved Is Jeff Bezos At HP-Workday Deal? Amazon CEO Jeff Bezos can be none too pleased that a company he invested in is doing business with Amazon Web Services rival HP. Amazon Cloud: Is It Good For The Channel? Does it make sense for solution providers to resell the Amazon cloud? Here a few important questions you have to ask in order to make the decision to put the livelihood of your customers' business on the Amazon cloud. From server virtualization to virtual desktop infrastructure to network virtualization, CRN's Virtualization 50 celebrates the vendors tackling the different facets of virtualization technologies. Here is CRN's list of 50 breakthrough tools - software platforms, applications and cloud services - that partners can use to run their own business and more effectively manage their customers' business. Dimension Data is setting up its cloud services business to give corporate customers what they're missing from Amazon Web Services. Unlike the Carly Fiorina and Leo Apotheker stewardships, current HP CEO Meg Whitman has the right attitude for driving channel growth. The winners of CRN's 2013 Channel Champions survey, an annual look at how the channel and its solution providers view their vendor partners' products and services. On the strength of its partner relationships, APC by Schneider Electric celebrates its 20th consecutive year as a CRN Channel Champion honoree. Here we present CRN's inaugural Big Data 100 list, identifying vendors that have demonstrated an ability to innovate in bringing to market products and technologies that help businesses manage big data. Paul Maritz is known for avoiding technology hyperbole. But even he knows that his big data business applications play is no small experiment. 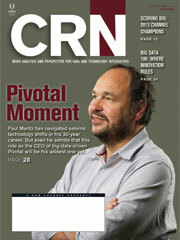 Pivotal CEO Paul Maritz spoke exclusively to CRN about how the ambitious new big data venture from EMC and VMware will tackle Amazon Web Services. Software-defined networking, mobility and the cloud has everyone in the network space upping their game. Here are 10 products that you must check out. Frank Vitagliano joins Dell after seven years at Juniper Networks. He tells CRN why he made the move. CRN checks in with the Channel@Work volunteer team, which made a trip to Grandma's House, an intergenerational nursing home. The project took place in conjunction with last month's XChange Solution Provider 2013 event in Orlando, Fla. Interested in in establishing a beachhead in the big data market? Pivotal CEO Paul Maritz offers solution providers a few thoughts on vertical expertise and education. The 2013 Partner Program Guide: What Has Your IT Vendor Done For You Lately? CRN's 2013 Partner Program Guide offers solution providers the information they need to evaluate IT vendors and their channel partner programs. Details on the leading hardware and software solution provider programs. CRN looks at the systems vendors in our annual Partner Program Guide that received the 5-star award for their commitment and services offered to their channel partners. The following vendors in CRN's annual Partner Program Guide received the 5-star award for their development tools, business applications and virtualization software partner program offerings. It takes a lot stand out in the networking world these days, but the five-star vendors on this year's Partner Programs Guide managed to do so by offering the best programs in software defined networking, unified communications and more. When it comes to securing partner programs, these vendors went above and beyond with their antivirus, firewalls, intrusion detection and other security offerings. CRN looks at the storage vendors that received the 5-star award in our annual Partner Program Guide, for their commitment and services offered to their channel partners. The following vendors in CRN's annual Partner Program Guide received the 5-star award for their Software-as-a-Service, cloud hosting, cloud services and other cloud-based programs. The following vendors in our annual Partner Program Guide received the 5-star award based on their displays, components and digital signage in the peripherals space. CRN honors distributors as part of our annual Partner Program Guide, including Tech Data, ScanSource, D&H Distributing, Avnet Technology Solutions and SYNNEX. Are you apprehensive about migrating to the cloud? Check out the 20 major cloud security companies that made this year's Cloud 100 list. Channel partners and MSPs are turning to managed print as a means of helping customers get budgetary control of a long-standing cost center. From high-end graphics cards to motherboards, these components are pushing the limits and capabilities of today's systems. The IT decision-maker is changing and those stuck on the traditional VAR model must shift the conversation from products to business outcomes. The time is now for the channel to reap the rewards of deploying cloud services. But while the key attribute to capitalizing on past tech trends were technical skills, the future in the cloud is all about sales and marketing. In the wake of high profile cloud outages, it's time for solution providers to take a critical look at their web services partner. IT vendors willing to invest in non-product-based skills show their solution provider partners that they are willing to make an investment in their company. Is It Too Late For HP's Whitman To Mend Channel Fences? 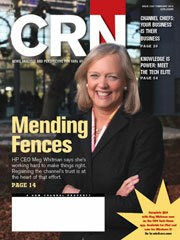 HP CEO MEG Whitman knows the best way to stop HP-bashing in its tracks is to get the channel to believe again. Can she rebuild the trust? HP is pairing a new 'pay for performance'-focused PartnerOne overhaul with a stepped-up solution provider recruitment effort. These 255 executives are the who's who of channel management. As solutions providers move into the cloud services era, GE Capital is helping to usher in a new era of IT financing. While selling hardware may be your bread and butter right now, it's very possible that your customers are hiding something from you. The channel has changed quite a bit in the last decade. Here are three key elements to examine when evaluating potential vendor partners. CRN's Tech 10 looks at products that showcase how dynamic and diverse today's storage market has become, including cloud storage, game-changing hard drive and SSD offerings and a variety of hardware and software combinations. 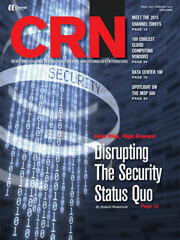 Preserving the security of customer data is one of the most profound challenges faced by channel partners in 2013. And while exploits targeting large financial institutions and other enterprises tend to get the most attention, the dangers extend to companies of all sizes. Cisco Worldwide Partner Organization boss Bruce Klein discusses priorities for the coming year in his first on-the-record interview since taking the job. CRN's annual Data Center 100 shines a light on the key technology vendors that are powering today's data center with everything from data backup tools to virtual data center solutions to cloud hosting services. GreenPages CEO Ron Dupler tells CRN how he transformed the Kittery, Maine-based solution provider into a cloud powerhouse. This year, the cloud will become widespread and used in revolutionary ways we didn't imagine a short time ago. By failing to distribute Microsoft Surface through the commercial sales channel will force Microsoft to rethink its channel strategy. Ochs: Return On Investment: What's Your Break-Even? Return on investment is one of the most often missed components of a recruitment presentation when vendors recruit solution providers. For long-standing channel partners Microsoft and Hewlett-Packard, the time is now to make things right for HP partners and Microsoft partners. Dell's recent news that it's driving toward a potential private equity deal sounds like a good thing. From servers to laptops to tablets, 2012 was a great year of great products. Here are the ones we found to be the best. Here's a look at the winners of the 2012 Tech Innovator Awards, including the CRN Test Center's 2012 Editor's Choice for the most innovative product of the year. HP says former Autonomy CEO Dr. Mike Lynch should get ready to testify under oath about alleged accounting improprieties under the penalty of perjury. Just before Polycom was about to fade away, the videoconferencing provider did several things to solidify its position in the marketplace. Solution providers attending last week's VCE partner conference speak with CRN and say that the challenge remains how to convince customers to invest in the fully created Vblock stack and pay a premium for it. Small storage vendors looked up, large vendors looked down and everyone looked at the storage cloud, flash technology and even old-school storage technology in 2012 to build the storage infrastructures that will impact customers in 2013 and beyond. It was a wild year for the networking segment, with major changes in the channels of Cisco, Juniper and other major players, as well as with the industry-wide SDN trend starting to take hold in a big way. Here are the 10 stories that kept us buzzing this year. There were many channel blunders this year, but none worse than Microsoft's decision not to use the channel to sell its new Surface Tablet. In cases where partners did not qualify for vendor-marketing support, they aligned with newer, competitive brands that were less established. UBM is giving back with Business4Better. Get ready for a year of accelerating consolidation in channels and the industry as a whole in 2013. 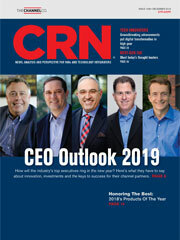 In a year marked by significant technology innovation, CRN looks at the 100 executives that left their mark on the channel and made an impact throughout the industry. Here is our list of the Top 100 Executives of 2012. Get a first look at CRN's second annual exclusive new research study, Best Companies To Partner With, which asked solution providers to rank their must-have technology vendors. Top solution providers are confident the Obama Administration and Congress will avoid crushing BCA sequestration. President Obama's re-election will lead to tax hikes and hurt businesses, some solution providers say. Intel said the next generation of Itanium processors, code-named "Kittson," will make it possible to design common server platforms that can support either the Itanium or its x86-based Xeon processors. As Fortinet creates its predictions for 2013, it also expects increases in two-factor authentication and "Fast Flux" rotation of IP addresses to conceal malicious servers. Although Hurricane Sandy slammed into the East Coast this week creating widespread damage, cloud networks held up for the most part. Avaya will focus on two distinct selling motions while it continues to invest to enable partners, top Avaya channel and sales executives said Thursday. Which Compensation Model Will Be The Winner? As service provider vendors, IT and carrriers alike, refine the value propositions they make to you, they are watching your response to up-front or bonus-driven compensation. Having a Harvard MBA may get you into the Harvard Club, but it's not the best route to becoming a successful channel chief. In an unscientific look at some company websites, some put partners front and center, while others buried their partner links. From Superstorm Sandy to the presidential elections, the past 30 days have provided a treasure-trove of insights for solution providers. Cisco's ability to see market transitions and constantly reinvent itself have kept it thriving and made it a better channel partner than any peer, said CEO John Chambers. Windows 8 has arrived, and that means for many, it finally will be time to migrate from Windows XP, for which Microsoft is set to end support early next year. While questions abound over how quickly customers will adopt Windows 8, solution providers see Windows-based tablets providing an alternative to Apple's iPad in corporate computing environments. Windows 8 is here and with it comes a slew of devices ready to run the latest release of Microsoft's OS. Here we take a look at a dozen Windows 8-ready tablets, Ultrabooks and convertible PCs. 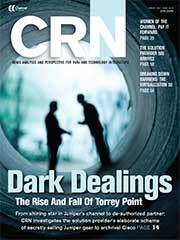 For more than a generation, CRN's ARC has highlighted what makes vendor partners great. And it's all from those who know best: solution providers. Solution providers in the managed print services (MPS) space can stand to gain by incorporating mobile print software. CRN recognizes AT&T Toggle, Red Funnel FatStax and Waze, by a company of the same name, in its annual Enterprise App Awards. Twenty-five years ago, Sam Haffar and his brother Jason started out building white-box PCs, and now they've made a deal to be acquired by Stratos Management Systems. When it came to education and training, solution providers scored vendor-provided technical training first and sales training second, ahead of other training disciplines. When it comes to good channel programs, many vendors talk the talk, but few walk the walk, with one exception: Cisco. Customer buying behaviors are changing and solution providers need to match their product and service portfolios to that spend. Digital signage is expanding to include smaller-scale displays that offer a more personalized and interactive experience for users. HP Executive Vice President Todd Bradley says the company's channel strength gives it a hands-down advantage in the business market versus Apple iPad and Microsoft Surface. The convergence of the VAR and telecom agent channels is an intricate puzzle with many moving pieces. Here's a list of who's ready, willing and able to play. Execs from companies on CRN's 2012 Fast Growth list offer up seven tips on how to revitalize a business, so that when opportunity knocks you'll be ready to go where the market takes you. Past and present come together in this high-performance, high-availability storage appliance. Cisco's worldwide sales chief says the vendor ecosystem is naturally a gray area: Cisco will partner with vendors in some areas and compete with them in others. Neil Isford, an IBM VP, was CEO of a New York VAR two blocks from the World Trade Center. He still remembers the events like they were yesterday. Moore's Law is alive and well, Intel said Wednesday, with 14nm chips in the pipeline for 2013 and 10nm chips next in line. A look at where HP was a year ago, where it is now, and where it needs to go. For one executive, the move to an Apple laptop from IBM Wintel was a natural migration. Microsoft may not be any competition for Apple in the tablet market, but in the enterprise, Windows-based tablets will do well. The CRN Test Center examined hundreds of apps to find the best options for improving communication and increasing productivity. Here's Part 2 of our list. 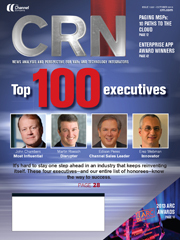 CRN's 2012 Emerging Vendors list includes companies from every technology segment, having been established in 2006 or later, and have a strategy to leverage the channel to go to market. 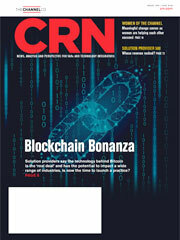 CRN's Next-Gen 250 spotlights the solution providers that are positioning themselves for the next wave of technology and business model shifts, including virtualization, cloud computing, data center and mobility. 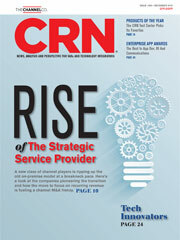 Fifty leading start-up solution providers from the 2012 CRN Next-Gen 250 list. CRN's Best of Breed (BoB) conference will host experts that can advise solution providers how to transition to the cloud computing services model. IPED numbers show that a majority of U.S. solution providers are recognizing a full 5 percent or more of their annual revenues are recurring revenues from cloud or managed services. If the latest numbers are any indication, Lenovo will be the one to watch. Is It Curtains For DMRs? Direct market resellers are going to be an extinct species in five years. Steve Ballmer is fired up, and he is talking about a new, more competitive Microsoft. It is a Microsoft playing offense, willing to do what it takes to win as it moves to stop anyone from wresting away its crown as the world leader in bringing personal computing to the masses. Microsoft CEO Steve Ballmer didn't hold back in an exclusive interview with CRN, saying the software giant will leave no stone unturned -- not the consumer cloud or any kind of hardware software innovation -- in its battle with Apple. Here's the full transcript. This year, CRN honors 208 Women of the Channel, each deserving of recognition for their accomplishments at solution provider, vendor, distributor and other organizations. Microsoft's Steve Ballmer is back and his competitive juices are flowing again. Help your vendors look forward rather than in the rear view mirror by ensuring they understand the value of your programs. Damore: Can We Have It All? 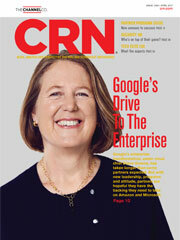 We salute women who make a difference in technology in CRN's Annual Women of the Channel issue. Microsoft should put a plan in place to drive its tablet through solution providers in the business marketplace. Our annual ranking of the top solution providers in North America. Profiles of the companies that earned special distinction at our Solution Provider 500 Awards. CRN takes a look at the behind-the-scenes players that make sure solution provider partnerships thrive and business gets done. Microsoft's decision to build its own tablet and sell it directly marks a sea change in IT and an admission that the market has shifted. Partners are left dazed and confused over Microsoft's recent Surface tablet launch. An IPED 2012 survey finds that when cloud service is an application like Salesforce.com, new buyers are primary decision-makers. New programs and services and a hard line in the sand for EMC's direct sales force are testament to the storage giant's channel transformation. Bill Scannell, the 27-year EMC veteran, sat down with CRN to discuss the storage giant's push to move more services business through partners. EMC is pushing hard to embrace the channel and eliminate its intensely direct-sales culture. On the heels of EMC World, the CEO of the world's largest storage vendor sat down with CRN to tackle a variety of topics. Chip maker's Trinity APUs are designed to boost graphics performance and accelerate apps on desktop, notebook and Ultrathin PCs. EMC has the opportunity to build the broadest, most technically astute and most profitable channel. Apple's Francois Daumard has led a channel charge aimed at driving the iPad and iPhone deeper into businesses of all sizes. By adding cloud services, solution providers could initiate transformation of their business models from Legacy to Transformative with recurring revenue. For 22 years, CRN has awarded the Channel Champions distinction to vendors that have earned the right to be called the "creme de la creme." Professional and managed services offerings that go wide and deep will preserve the channel, A/V integrator's leaders say. Chris Lynch sold Vertica to HP last year and has since gone on to invest in big data start-ups. 'It's bigger than one company. It's a movement,' he says. Intermec took a thoughtful, long-term and strategic view of the channel to build a world-class channel offering in only two-and-a-half years. Position marketing will become more prevalent due to the loss of brand identity to the end user as a result of the cloud. Small businesses' compliance with data protection regulations could be a gold mine for the channel. Self-proclaimed purist Ochs explains the difference between a managed service and a cloud service citing a June 2009 Gartner publication. We're recognizing 30 IT executives who have been in the industry for at least 30 years and have helped shaped the technology channel into what it is today. We're recognizing 30 channel leaders that are still in their 30s. Customers can deploy, transition, monitor and manage servers, storage and bandwidth using a customized portal using Pomeroy Managed Cloud Services. Intel's Steve Dallman said that the company's new mobile strategy and Atom "Medfield" chips will ultimately yield growth opportunities for its partners. Our annual directory of hardware and software vendor partner programs. Our annual directory of hardware and software vendor partner programs, broken down by technology specialty. AMD unveiled Tuesday its new line-up of low-power Opteron 3200 server processors for energy-efficient data centers and cloud-based servers. CRN's Cloud 100 is a who's who in the cloud market, representing the most innovative companies across five categories: cloud platforms, cloud infrastructure, cloud storage, cloud security and cloud software. The M&A madness we see today is about making an almost unimaginable business transformation to where businesses are buying IT as a service. A successful cloud-computing strategy often involves customizing services from one or more vendors, according to Gartner. One way to do this is through a cloud services brokerage. 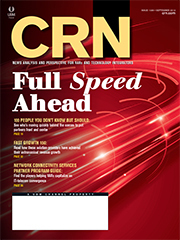 For 30 years, CRN has been chronicling technology and providing analysis as to why it is important to sell technology systems to customers. 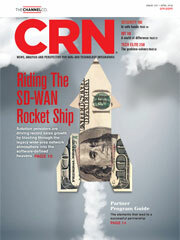 Happy Anniversary, CRN. The future of computing is increasingly going to experience a bigger effort to transfer costs up the sales chain. CEO Meg Whitman has literally taken down fences at HP and brought the stability partners crave, but now comes the hard part: implementing and executing on a strategy for the long term. Meet the executives responsible for running channels at vendors in the IT market. We present this year's CRN Tech Elite 250, the definitive list of solution providers with deep technical expertise and premier certifications serving customers in North America. ShoreTel partners say the acquisition of hosted UC vendor M5 is a blockbuster, but the company needs to be clear about integration plans and where M5 will fit. AMD unveils its two-year product roadmap, targeting ultra-thin computers and low-power processors for today's cloud-powering datacenters. Most solution providers are open to the topic of transforming their businesses, and they are approaching their vendors as a first point of contact looking for direction and education. What will next year hold for telco mergers and the mobile device boom? 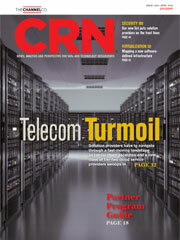 CRN makes its 2012 predictions for the Telecom industry. CRN looks into its crystal ball and sees Android, hactivisim and cyber-espionage as some of the top 10 security threats in 2012. CRN was on hand at CES 2012, bringing up-to-the-minute coverage of the biggest keynotes and providing an exclusive look at our favorite tablet PCs, ultrabooks, new cloud technologies and everything else from the show floor. We chat with F5 Networks' John McAdam about the vendor's momentum and how he plans to keep it going. Part one of CRN's Data Center 100, takes a look at some of the top technology vendors in the data center market. Part two of CRN's Data Center 100, continues our look at the top technology vendors in the data center community. Will Cloud Computing Kill Distribution? Distributors look to stay relevant to solution providers as technology shifts underneath them yet again. 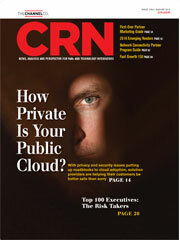 Eight distributors reveal their plans of action to get themselves to the cloud. Burke offers up five tips to success in 2012 culled from top solution providers, UBM Channel Research and CIOs. Damore makes the switch to iPhone and iPad at work and demonstrates why solution providers shouldn't ignore the consumerization of IT. The pros and cons of volume-based discounting. From processors to tablets, from PCs to laptops, this was a great year of great products. Here are what we found to be the best. The CRN Test Center puts four digital signage products to the test. Check out CRN's list of the vendors in the videoconferencing space the channel should know. CRN takes a look at the emerging vendors in the videoconferencing space. AMD has officially launched its much-anticipated Opteron 6200 'Interlagos' processors, boasting a boost in server performance by up to 84 percent. Eaton's scored big in virtualization with software that provides virtual machine live migration and cluster shutdown. Valuable solution providers are now characterized by their ability to capture customer spend in the data center, when it's hosted or when it's in the cloud. CRN is unveiling the Channel Business Index to get a real-world view of solution provider confidence and business outlook in the channel. Oracle President Mark Hurd lays the foundation for Oracle's channel charge, which in part involves a Hurd-designed sales plan that has focused Oracle's partners on the hard-to-reach midmarket and SMB accounts. Oracle Senior Vice President Judson Althoff takes off where Mark Hurd left off, using strategic skills to move Oracle in position for partner recruitment blitz. Check out our list of the managed service providers the channel needs to know. Check out our list of the emerging managed service providers the channel needs to know. Get a first look at CRN's exclusive new research study, Best Companies To Partner With, which asked solution providers to rank their must-have technology vendors. Under Mark Hurd, Oracle has more indirect sales representatives covering more of the market with more success than ever before. In the last year, we have seen widespread telco and cable company interest in recruiting network resellers and integrators to their agent programs, a good opportunity to consider. Inaugural Best Of Breed conference brought together leading and next-gen VARs who imparted their wisdom to the channel. Partner portals are not dead, but they should be reconstructed from the ground up with the user in mind. 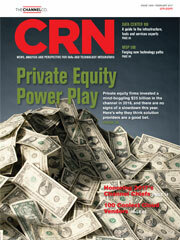 High quality and great return on investment--those are what puts a vendor at the top of CRN's Annual Report Card. Although full convergence is not yet here, many carriers say that traditional IT and equipment VARs are quickly becoming their fastest-growing partner base. Foxit Software makes a bold stab at stepping up to Adobe and taking a crack at stealing market share in the PDF marketplace with its most recent version of PhantomPDF. Apple is reaching out to IT solution providers to help with the mountain of integration services that's being created by the ongoing boom in iPhone and iPad sales. Steve Jobs is gone, but the impact he had on Apple resellers who've espoused his approach to doing business isn't going away. Cisco details weaknesses it sees in Hewlett-Packard if it proceeds with plans to spin off its PC business. Though the late Apple CEO Steve Jobs is mourned as a technology visionary, he was actually the ultimate solution provider, with the ability to create "insanely great" products" from standard hardware and software. VARs today should gain and invest in software expertise because they are the critical differentiators in a crowded market, with IT budgets shifting or decreasing. Those who call this the 'Post-PC era' couldn't be further from reality. The transformative VAR or solution provider of the future is one who can sell private, public and hybrid cloud-based solutions in addition to its standard offerings. Where In The Cloud Do You Sit? We are seeing some common attributes among solution providers that fall into the three categories as they relate to the move to cloud computing: vintage, progressive and transformational partners. These companies measure growth by the thousands. A solid foundation for building and maintaining a Fast Growth company is dependent on mastering the three 'Ps:' Planning, People and Partnering. Check out our list of the vendors in the business application software space the channel needs to know. 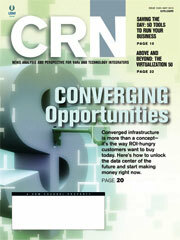 CRN looks at the emerging vendors in the business application space that the channel needs to know. Todd Bradley, the executive vice president of HP's Personal Systems Group, says HP's partner commitment speaks for itself even as rival Dell mounts a full court press to recruit HP partners. 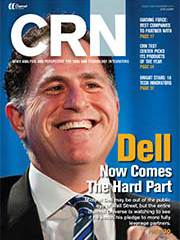 In an exclusive interview with CRN, Michael Dell says HP's potential exit from the PC business makes Dell the x86 partner of choice. September 11, 2001, changed the lives of New York VARs forever. Here are three of their stories. Cisco will spend $75 million on new resources and systems connected to its partner-led initiative, focused on midmarket and SMB sales by solution providers. Fueled by rival Hewlett-Packard's plan to spin off its $40 billion Personal Systems Group business, Michael Dell is on an all-out channel recruitment blitz. For the past two years, the same discussion has surfaced: Namely, which partner types, as defined by business model, will survive in the long run? HP needs to do a much better job of communicating with the channel and its customers about what a spin-off could mean for them. The HP decision to spin off its PC business could have proved to be healthy for HP, its competitors and the partner community. We take you to the classroom with no-cost or low-cost ways to increase sales and profits and transform your business, all before the holiday break. Intel's new $300 million Ultrabook Fund is expected to invest in hardware and software vendors the company expects will help drive its Ultrabook platform to market. New SSDs released over the last few months are coming to market with SAS, SATA, and Fibre Channel interfaces in a variety of form factors for embedded, blade server, rack mount, and storage system use. This Next-Gen 250 list is a snapshot of solution providers who are zeroing in on lucrative and emerging technologies, among them cloud computing, mobility, virtualization ,unified communications, business analytics and business intelligence. We profile three of our Next-Gen 250 solution providers who are taking advantage of the mobility revolution and offering integration and services on top of mobile platforms. Mobility is changing the world and how we do business, and it's having a radical impact on the solution provider marketplace. 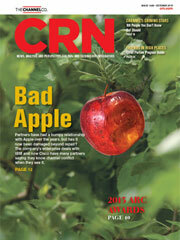 The CRN Test Center pits tablet vs. tablet, platform vs. platform. Where should you place your bets. Channel-facing vendors focusing on mobility. AMD says updated software development kit boosts development efficiency and provides access to the full functionality of A-series chips. News about Google's acquisition of Motorola Mobility plus Hewlett-Packard's killing its webOS devices, including its just-released TouchPad, has solution providers evaluationg where to place their bets in mobility. Our research shows that partners who specialize typically drive a higher gross margin performance. What drove the PC revolution is driving the mobile revolution: It isn't the platform but rather the applications on top of the platform. The adoption of cloud computing, while not yet universal, is growing and a path to a new channel will require extensive work by the partner community to remain successful. VMware's Paul Maritz is making moves--and taking some calculated risks--to help VMware leverage its lofty position as the virtualization software market leader into a dominant one in cloud computing. Check out our list of the emerging vendors in the software infrastructure space the channel needs to know. Check out our list of the vendors in the software infrastructure space the channel needs to know. Alliance and channel vendors of today and tomorrow indicated at IPED's Channel Masters seminar that partner recruitment is at the top of their list. In a special report on carriers and the cloud, we take a look at the compelling proposition for solution providers to attach recurring revenue to carrier services. The Best of Breed concept is not the same old, but a conference with a partner-built agenda that's poised to tee up the IT business model issues and allow partners to learn from each other. There are 215 new companies on the VAR500 list this year, the most turnover the annual ranking has seen yet. We honor 20 VAR500 members for their own transformations. 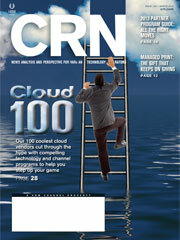 Check out part one of CRN's list of 100 people in the channel that you don't know but should. Check out part two of CRN's list of 100 people in the channel that you don't know but should. Check out our list of emergingg vendors in the cloud computing and SaaS markets. Phil Soran, founder and former top executive at Compellent before its recent acquisition by Dell, offered VARs and customers a look ahead at some of the enhancements planned for the Dell Compellent Storage Center. With twice the processors of the 6970, AMD's Radeon HD 6990 raises the bar on video graphics cards. SNC Squared's office was destroyed by a tornado, but the Joplin, Mo.-based VAR was back up the next day ready to help clients. Here's how they did it. Are You Up To Speed On Mobility Yet? The ability to sell and support new wireless applications, the resulting communications infrastructure and, ultimately, the management of these ubiquitous mobile devices offer the next growth opportunity. Denali Advanced Integration, Redmond, Wash., becomes the first company in the history of the VAR500 to be awarded by CRN for its community service. Custom system builders and boutique PC makers are carving out a niche in the suddenly crowded tablet market. The CRN Test Center looks at three new products from Toshiba, LG and Orb Audio. Dell's Opteron-based PowerEdge C6145 server reached a peak Geekbench score of 22,607. BitDefender delivers a one-two punch by increasing its engagement with VARs and launching its Business Solution Version 3.5 security management solution aimed at small and midsize businesses. With disruption near or at an all-time high in the IT industry, VARs, more than ever, will need to write more software to perform a wide range of functions. Another data center trend is increased spending, much of which will be on ramping up power. Xerox CEO Ursula Burns is enjoying her coming-out party with the channel, and talking about her company as "the new Xerox." Ursula Burns, the first female African-American CEO of a company the size of Xerox, shoots straight from the hip about the more channel-focused company, about strategy and about life. Xerox and Cisco aim to bring more managed print, mobile print and cloud IT outsourcing services to solution providers, particularly to Cisco partners. McAfee launched an all-in-one Cloud Security Platform, protecting Web, e-mail and identity traffic traveling to and from the cloud. With 22-nm process, Intel 3-D processor graduates from Ivy Bridge to Ivy League. 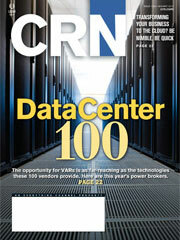 Check out part two of CRN's Virtualization 100, a comprehensive list of who's who in the virtualization space. Check out our list of vendors in the peripherals market that VARs need to know. Check out our list of emerging peripherals vendors making their presence known in the channel. John Landry, who has been out in front of the biggest technology paradigm shifts for the past three decades, uses to describe the three immutable forces of nature that are reshaping every nook and cranny of the technology business. Even before Ursula Burns stepped into the Xerox CEO role, she had big shoes to fill. Can distribution find a role in the world of cloud computing where most of the world buys computing power much like it does electrical power? 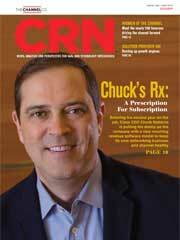 Solution providers ranked their vendors across 26 product categories in CRN's annual Channel Champions survey. Here's who came out on top. Is The Android Operating System Too Risky For Enterprise Business? The Test Center loves many things about Android, but the platform's security isn't one of them. For enterprises, that means the potential risks to corporate data is just too high. Samsung's rise to within four percent of Intel in the semiconductor market is reflective of growth in the memory segment, according to IHS iSuppli. Is Technology Sales Now A Blood Sport? The political power plays vendors are engaged in today are dangerous for solution providers and the channel as a whole. There's a new component in the matter of compensation: the added complication of vendor products brought to market by service providers. The business model in the next five years will be about specializing, and drilling down into verticals, call them 'microverticals,' will be key. The trouble with the cloud is there's no one to call when you have an issue, and that's an opportunity for solution providers. Check out our list of the emerging hardware infrastructure vendors making their presence known in the channel. Check out our list of hardware infrastructure vendors that the channel needs to know. In this year's Partner Program Guide, we see 5-Star vendors ratchet up services and resources they provide to VAR partners. Here, we spotlight the Top 100 cloud computing vendors for 2011 across five categories: cloud platforms, cloud infrastructure, cloud security, cloud storage and cloud software and apps. So, I've spoken with two sets of managed service providers: One school believes public cloud service providers compete with managed service providers. The other school believes public cloud service providers offer additional products that can be repackaged and sold to supplement their managed offerings. Which is correct? Leo Apotheker, HP's CEO of just a few months stepped into the spotlight recently in an interview with CRN and in a separate presentation to investors where he began to set forth what the future of HP will look like. Intel and AMD bet big on revolutionary new architectures that combine CPU and GPU capabilities on a single piece of silicon. The CRN Test Center gets under the hood of three products from HyperOffice, HP and Dell that pack both value and high performance. 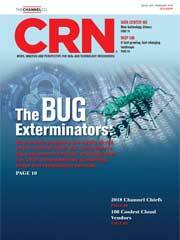 The CRN Test Center evaluates a VDI solution from Hewlett-Packard. The data center trend toward consolidation and virtualization is creating a spate of new tools designed to handle asset management and power consumption. Seagate's Free Agent GoFlex Desk provides 3 TB of desktop storage, along with a backup and recover solution that the CRN Test Center evaluates and reviews. The pure-Android platform amounts to a clean slate for solution providers. Three-pound tablet offers solution providers a highly capable input device. High-performance and mission-critical applications have customers increasing their use of SSD and Flash memory module technologies. Mobile virtualization could help IT departments deal with one of their most persistent challenges: Allowing workers to use their personal mobile devices in business scenarios. Our first annual Tech Elite 250 list features solution providers characterized by their unique solutions methodology, the highest-tier, multiple vendor certifications, and a heavy services and software IQ. Panasonic's all-in-one KX-MB2061 office machine adds voice mail and a cordless telephone to the usual mix of printing, scanning, copying and faxing capabilities, all for a list price of $249. So what's woman-owned, Louisiana-based computer services company Barrister Global Services Network's secret to surviving a stock delisting, 1,300-mile move and a natural disaster -- and still going strong? These 200-plus executives are the who's who of channel management--heading up the partner programs solution providers depend on to run their business. 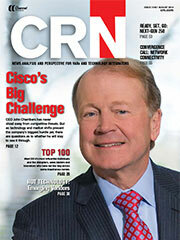 Cisco Systems CEO John Chambers sits down with CRN for a wide-ranging conversation touching on the growth of the Cisco channel, why he believes Cisco is a compelling bet for partners and what role the network, collaboration, video and other Cisco hallmarks will play in the businesses of the future. A few weeks ahead of Cisco's annual partner conference, Chairman and CEO John Chambers outlines the path to success for Cisco solution providers, which runs straight through the cloud. A new breed of super-cool solution providers is breaking away from the channel pack with best-in-class, high-business-impact solutions for customers. We honor them here in our first annual CRN Tech Elite list. Cisco, IBM, EMC, Verizon-Terremark, SHI: Who are your server and storage vendors today? The cloud change is real, and for solution providers there are some things you need to know if you are going to be able to run a successful company for the long term. Organizations need to make investments in new skills. This was the reasoning behind our newest list, the Tech Elite 250. Looking to jump into the security market? Check out CRN's list of the top technology vendors you should be rubbing elbows with. The 2011 State of the Market survey, conducted in November, looks at business issues and trends in the first half of 2010 and business projections for 2011. New customer needs support hybrid computing environments that mix customer on-premise data centers, hosting and data center virtualization. Some IT departments are resisting the tablet, but the fact is as more of us buy personal iPads, we are going to pressure CIOs to make them functional as a work device.